The amount of third party Twitter apps available is somewhat crazy, but as long as they are quality apps, no one should really be complaining. 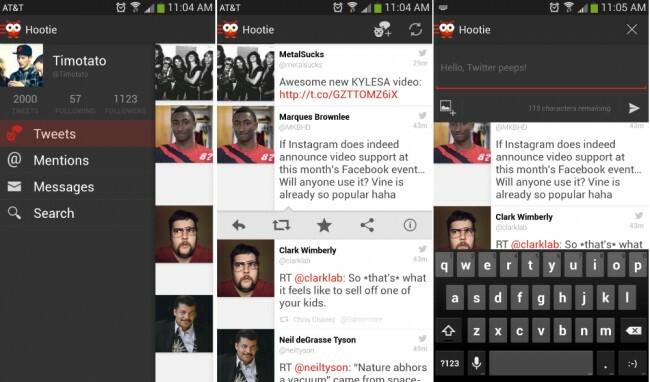 Some of the more well-known options are insanely popular such as Falcon Pro, Tweet Lanes and even Plume. Today, we are taking a quick peak at another third party option called, Hootie. Yep, kind of rings a few bells. This app, from the time I have spent with it, is designed to look better than most on tablets. It uses a single stream, allowing for images to take center stage, while also adding in a few design tricks that make retweeting and replying to tweets a nice and streamlined experience. It doesn’t offer many of the more in-depth features that others do, but it is a relatively new app, with tons of room for growth and improvements. If you might be looking for a new Twitter experience on your Android tablet, definitely check it out.